I get an idea in my head and I can’t let it go. That happened on Sunday, after my long draw spinning practice. I had no more rolags to practice with, and I discovered that rolags are hard to find and rather expensive. I completely understand why and I think they should be. They are very time intensive. I have a pair of hand cards, so I could have used my own wool to create rolags, but it seemed too silly to me. Using commercially processed wool to create something hand processed is like….going backwards. And then it hit me. Like a ton of bricks. I realized what I really wanted. I mean, what I really really REALLY wanted, was my own fleece to process and handcard. I mean…I REALLY wanted that fleece and I wanted it RIGHT NOW. By Monday morning I couldn’t stop thinking about a fleece. I started seeking out a fleece I could call my own. But somehow, purchasing a fleece sight unseen for someone like me who doesn’t actually know what she is looking for seemed like a gamble. I was also wary of the price of shipping. It is all fine and good to pay a decent amount for a fleece, but with shipping it seemed that the price could double. I then resigned myself to talking about wanting a fleece. I asked my friend Sarah if she remembered seeing any at the IA Sheep and Wool Festival last year. She said she had. I decided I could surely wait ’till June to have a fleece of my very own. And then Sarah came up with a brilliant plan. “Why don’t you ask Carin for one of her fleece? She has 3, don’t you remember?” Oh BRILLIANT! I knew Carin had 2 she was going to send out for processing, so I emailed her to ask if she was willing to part with one. Carin, having a large stash of many types of fibery goodness, can usually be convinced to part with things, she is like a local yarn shop all to ourselves. But she works nights, and I had to wait ALL DAY LONG for a response! It was painful. Really painful. I then got a message from Carin saying she’d bring both fleece and I could look them over. This gave me another task to fill my time and obsess over. Finding last years video cast where she showed off the fleece from Estes Park CO. I found it, watched it, sent the link to Nick, made him watch it, obsessed some more…it was intense! Had my heart set on Opal, the black CVM/Romeldale. I thought Sepia was nice too, such a rich kind of brown color, but I wanted that black fleece! On Wednesday evening, I waited and waited for Carin to show up at knit night. Such anticipation! And she chose that day to oversleep! Thankfully, she came bearing fleece, and I was able to get an up close look at them. Also, thankfully, I have friends who can really talk me down from a crazy idea. 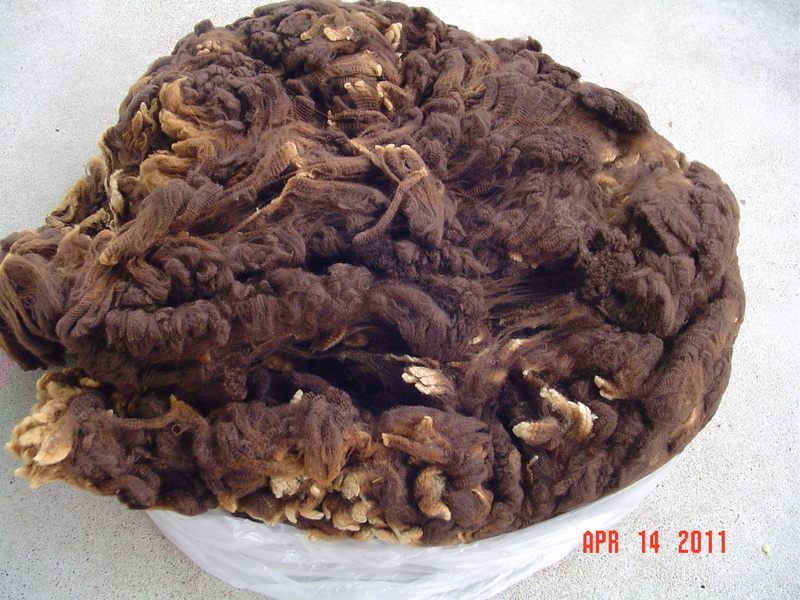 Carin patiently explained that the brown fleece was from a lamb, weighing only 3 pounds. And that her fleece, Millie, that she had started processing the year before was also from a lamb and only 3 pounds and she was still processing it. And thus, starting with the small fleece would be the way to go. And if I liked it, she could just get me another black fleece in Estes Park. Very smart woman that Carin, and enabler but not without logic! 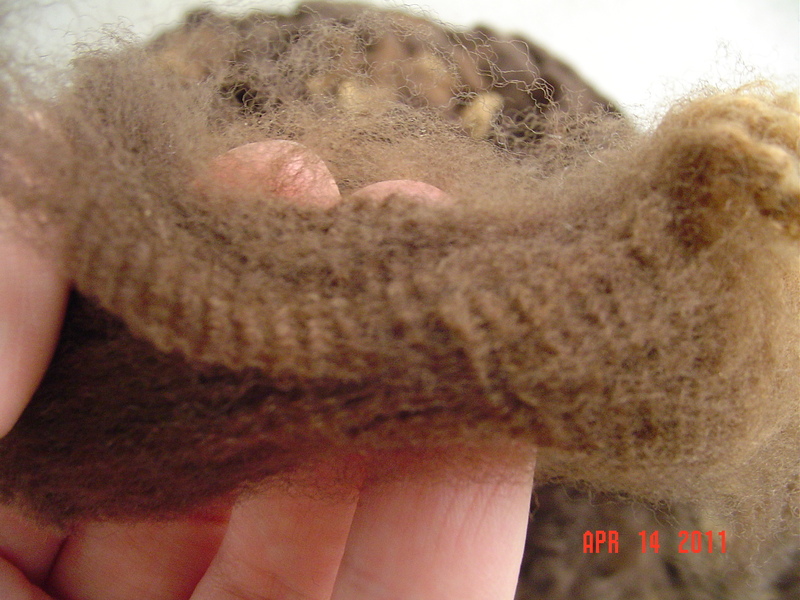 So I introduce to you the fleece from Sepia of Black Pines Sheep. This is Romeldale CVM. Such a pretty pretty color! This was a coated fleece, so it shouldn’t be too terribly tough to process. At 3 pounds I should have enough for a sweater AND for a bunch of long draw spinning practice. And it truly IS significantly cheaper to process your own wool. I am amazed!